The Thai Muang Golf Course offers the only championship golf course available along the breathtaking Andaman Coast. Located in Phang-nga province, just 30 minutes by road from Phuket International Airport, it sits in arguably one of the most stunning areas of Thailand's west coast. Far enough from the bustle of Phuket to retain its natural calm and tranquility, yet close enough to take advantage of the conveniences the international island affords, Thai Muang offers an experience hard to match on Phuket. Dye Design Inc. was given a tough mission when presented with the comparatively flat and unvaried coastal site. However, they answered the challenge with their usual flair and have magically produced a course which presents a captivating challenge for players of all abilities. This 18 hole, par 72 course covers a total of 7,019 yards of a typical Dye Design character. Undulating fairways with acute mounding stretching over multi-level terrain lead you past deep sand bunkers, around wild waste areas and over a wonderful variety of water hazards including ponds, streams and miniature lagoons. With spectacular views across the soft turquoise hues of the captivating Andaman Sea, the refreshing sea breezes and immaculate white sands coupled with the comfortable clubhouse and comprehensive facilities, the Thai Muang Golf Course is a rare gem in the golf destinations of Thailand. 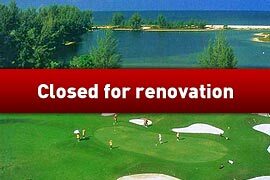 Thai Muang Beach Golf & Marina has been closed since 2007 for the major renovation.